Competition between large scale supermarkets in the Boston area is expected to rise as Wegmans plans to expand its influence in Boston while H mart makes no further moves on the plan to open a branch in Cambridge. Wegmans, which has its headquarters in New York and 81 other branches throughout 6 states, has gained fame for specializing in organic products and groceries from Italy. It also has attracted many customers by offering food bars for catering, market cafés and pharmacies in its branches. Wegmans, which has successfully opened up a 138,000 sq. ft. branch in Northborough in 2011, is preparing to enter the Boston area starting with the Landmark Center branch in Fenway. According to The Boston Globe, the Fenway branch is anticipating signing a contract soon, along with branches in Charlestown, South End and Brookline. 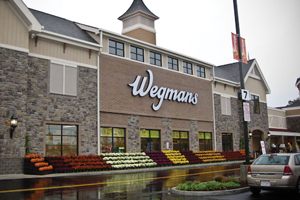 Wegmans proves itself as a large scale supermarket branch, as its 70,000 sq. ft. branch in Chestnut Hill is expected to be its smallest branch. As Wegmans enters Massachusetts, other supermarkets are on alert while the customers, including Koreans, expect broader shopping opportunities. Wegmans has been applauded for its broad range of items and excellent processed foods. She also expects various alluring customer events from other supermarkets competing with Wegmans. Wegmans’ goods and sizes differ greatly from those found in Korean markets. However, the Korean markets have to compete with them, as the dining culture of Korean families has been westernizing. According to many Korean families that have moved to the U.S. in recent years, the number of Korean dishes served at meals has been decreasing. Moreover, the Korean markets should also be aware of the fact that large scale American supermarkets are marketing globally and are no longer neglecting their Asian customers. Recently, Costco in Everett and BJ’s in Stoneham began selling seaweeds and organic tofus respectively. Many other markets have had ramen noodles on their shelves long before that, and some Stop and Shop and Shaw’s branches even have small portions of Kimchi. Meanwhile, Reliable Market, which renovated the store recently with new ownership, has gained more customers through niche marketing. Although small, the market is filled with an abundance of items. The small portions of side dishes like kimchi, processed foods, meats and seafood emphasize the market’s focus on the customers who are prioritizing small portions of fresh products. Wegmans, which was founded 100 years ago, started producing low priced self-brand products in 1979 and successfully reformed itself as a healthy food provider under the banner of “Food You Feel Good About” in 1992. Moreover, in 1995, it began selling pasta, canned tomatoes, olive oils and other authentic Italian food products, and by 2002, it reached the top of the organic food providers. Wegmans, which is now famous for its “6 dollars meal” has tried many marketing strategies to gain customers.